Graffiti loudly announcing the location of drug dealers popped up overnight on the 2200 block of Hancock Street Sunday after the pushers moved into the block to try and sell their wares. Drug dealers are fiercely territorial about their corners in Philadelphia. But some who tried to expand their reach recently found themselves painted into a corner when cheeky graffiti — including large arrows pointing to their perch — appeared overnight advertising their presence to police and passersby. 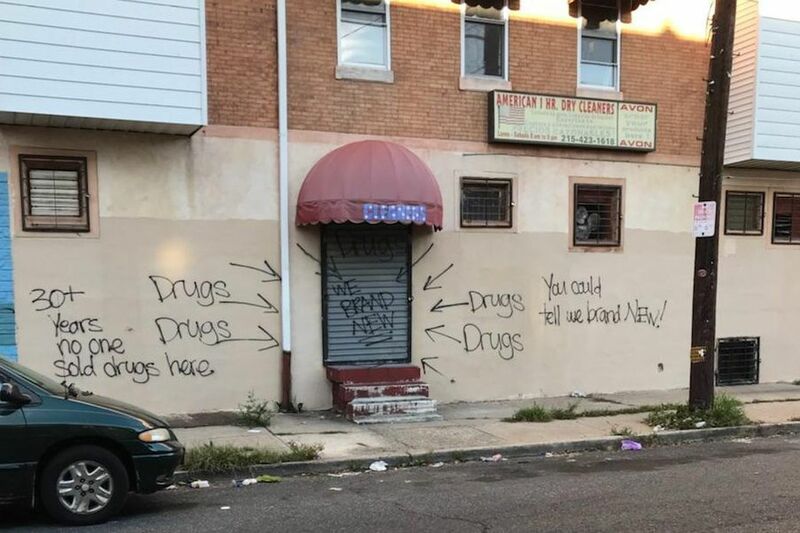 A photo posted on Reddit by user rubiredd — who asked that her real name be withheld — shows a shuttered dry-cleaning business on Hancock Street near Susquehanna Avenue in North Philly covered with graffiti that appears to indicate drug dealers tried to sling their wares on the business' steps. "Some young entrepreneurs tried to open a new drug corner and the neighbors were not happy," she captioned her photo. Along with the word "Drugs" in several places and nine arrows, the graffiti reads "30+ years no one sold drugs here" and "You could tell we brand NEW!" a comment apparently designed to mock the dealers' ignorance of the area. Rubiredd said the graffiti appeared Sunday, the day she posted the photo to Reddit. By Thursday, it was gone from the wall, painted over by city workers. Workers with Community Life Improvement Programs painted over the anti-drug graffiti in response to a 311 complaint this week. Neighbors on the block, including Beverly Patrick, 52, said they don't know who put up the anti-drug graffiti. "Everybody cheered them on, though, when they read it," said Patrick, who has lived in the area for 13 years. The block, which is catty-corner to Norris Square Park, is quiet and well-kept. It's also home to a new mural that went up this year of a squirrel munching on a SEPTA token, because this is Philly. Neighbors said there were few problems on the street. A 40-year-old block resident who has lived in the area for 30 years described the street as relatively quiet, aside from a few "ups and downs" in the summer. The man, who declined to give his name, had theories about who may have painted the graffiti, but no solid leads. Police have responded to the block 60 times so far this year, according to department data, mostly for minor disturbances. The last call for police on the 2200 block of Hancock Street came Sept. 20, for a disorderly crowd. Records don't indicate that police were called to the block this year for reports of drug dealing. Rubiredd said two days after the graffiti appeared, someone used black spray paint to scribble the words out. She said not pictured in the original photo was additional graffiti that read, "don't even think about it." When the graffiti was scribbled over, she said, the scribbler left only three words visible: "think about it." Graffiti announcing the location of drug dealers who tried to move into a North Philly block was scribbled over two days after it appeared. The day after the graffiti was crossed out, city workers painted everything over in beige. Mayoral spokeswoman Ajeenah Amir said workers with the city's Community Life Improvement Programs painted over the graffiti in response to a 311 complaint. Nobody knows who put up the graffiti and nobody but the person who did it may ever know. But one thing is certain: Nobody has been seen sitting on those steps since it went up. Patrick said she thought it was a "pretty cool" way to deal with a too-prevalent and dangerous problem without putting oneself in harm's way. "It was probably somebody around the neighborhood and they ain't taking it," she said of the graffiti do-gooder. "They don't play like that."